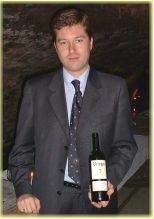 I first met Gil Nunez when he presented a tasting of the very fine Ribera del Duero wines from Bodegas Briego back in September 2001. A short time later Gil contacted me, to say that he had since departed Briego to join the relatively new Ribera del Duero bodega of Lopez Cristobal, which was founded only in 1994. He asked if I would taste the wines of his new employer, and subsequently a case of three wines arrived in Glasgow. This 50 hectare property is sited near the hilltop village of Roa del Duero, and is planted almost exclusively with Tinta del Pais (Tempranillo), with a little Cabernet Sauvignon and Merlot. Yields are kept extremely low, and ageing of the wines is in small barrels of both French and American oak. My first impression is that these are wines of very high quality indeed. All are savoury and structured, with plenty of punchy, deep fruit, but also seriously constructed with high extraction and plenty of tannin. All should benefit from cellaring. This relatively new Bodega is clearing setting its standards high, and is well worth investigating for fans of other top Ribera del Duero wines. UK Stockist is Raeburn Fine Wines. Vivid, medium-density deep crimson colour. Loaded with ground-coffee and mocha at first, this reveals vegetal, herby notes and cherry fruit, with little hints of violet. The palate is soft and yielding, with plenty of toast and spice wrapped around ripe berry fruit. There are small animal nuances, then fresh acidity and good, ripe tannins support into a long finish. Very delicious, but has the balance and concentration to age nicely over several years. Very deep crimson colour, quite opaque at core. Gorgeous nose, suffused with pencil-shavings, exotic spices and tobacco over glossy blackcurrant fruit. Little hints of menthol and dark chocolate, some vegetal nuances. The palate is dry and savoury, with a liquorice edge to deep, sinewy and lean black fruit that, for the moment, isn’t quite integrated with serious, dry, biting tannins and cherry acidity. There are layers of complexity here, with more smoke and tobacco rounding out the finish. A serious and structured wine. Those tannins worry me slightly, but if they integrate this should age well and be glorious over 10 years or more. A special selection from top vintages, with 5% each of Cabernet Sauvignon and Merlot added to Tempranillo. This spends 14 months in oak, split 50/50 French and American. It has a dark but bright crimson/cherry colour. The nose is suffused with toffee and sweet new oak, hints of mint, and a deep seam of glossy black fruit. The palate is filled with powerful and concentrated black fruit, that is built around a compact, mineral core. 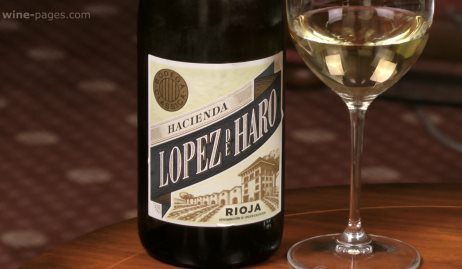 There are little juicy hints of sweet cherry and parma-violet, and the balance of tannins and acidity cuts through to leave the finish dry and tight, with good length. Another seriously styled wine with a long future ahead of it.